Convert PDF documents to Web pages. Is there a better alternative to PDFWebX? Is PDFWebX really the best app in Internet Utilities category? Will PDFWebX work good on macOS 10.13.4? 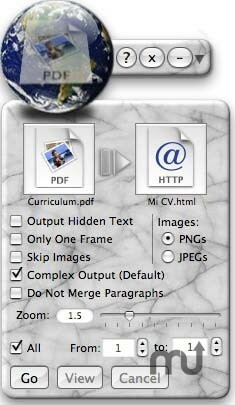 PDFWebX is the first program from FreshBroccoli. It's a PDF to Web Site converter with the GPL licence based on the programs pdftohtml and ghostscript. You just have to make use of drag & drop to have PDFWebX converting your PDF document into a complete Web site including frames, links, images, etc. PDFWebX needs a rating. Be the first to rate this app and get the discussion started!